The Kilkenny qualifier for the Irish Shows Association All Ireland ‘Home Cook Champion 2017’ was held in The Club House Hotel, in Kilkenny on Saturday last the 27th May. The winner was Noreen Malone of the Tory Hill I.C.A. Guild. 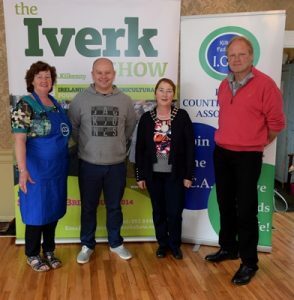 Pictured is L- R Noreen Malone, Eoin Scanlon,(Chef – Judge) Maria Landy, Kilkenny Federation president & Robert Dowley, Chairman of the Iverk Show society. The final of the competition will be held at the Iverk Show on 26th August 2017. The aim is creativity with Irish ingredients. First prize is €1,000. It will be hosted by Chef Adrian and is sponsored FloGas, ICA and NordMende.